The first step is to register your free account and complete your profile. I'm Louis, your Webtalk Pro guide to success. First join Webtalk via my invitation here and complete your registration. Use accurate information because to receive your commission payments your name must match your payment details which you will set up later. After you have registered and confirmed your registration by clicking the link that you will receive in an email, log in to your Webtalk account and then select "Profile" from the menu. Introduce yourself, your interests and your talent with various privacy settings for each section of your Profile page. Follow the progress bar to complete your profile as much as possible, you will not reach 100% at first, this will come later and I will help you with that. After filling out as much of your profile as possible, at least a real photo, full name, and About Me section, select "Track Referrals" from the top right 3 horizontal bar menu. There you will see your network statistics (empty at first) and your Landing Page Link: click on the Copy button to copy it, and share it with others to invite them to join, they will then be in your referral network! From the previous step you will have noticed your Landing Page link: this is what you give to others to invite them to join, so that you will earn commissions and they also, provided they follow the steps in this guide. How to earn will be explained in the third step. At this stage however you need to be inviting others to join Webtalk, and this is much easier than you think. First, you can use Webtalk to update your Facebook, LinkedIn, Twitter and other accounts simply by posting from Webtalk after linking the accounts on your settings page (from your Webtalk menu). Then, whenever you post an update and click on those boxes, your update will go to the other social networks too and each of your updates will have a link to your Webtalk: anyone that joins from there will be in your referral network! You will start to see the numbers on the Track Referrals page going up as people join via your links. In your Webtalk three bar menu top right you will find "Track Referrals". That is where you can see how many people you have invited who joined Webtalk, how many they have all invited and so on, to five levels of separation! For privacy reasons you won't see who is on the level 2-5 since you did not invited them directly, but you can see how many. Soon you will be seeing your earnings which will continue to be tracked even if you have not yet completed your profile and registered your payment details for payouts. To find out more about how to benefit from Webtalk and achieve more success, see the Success page. You can also send me a Connection Request or accept mine, and check your Webtalk news feed. 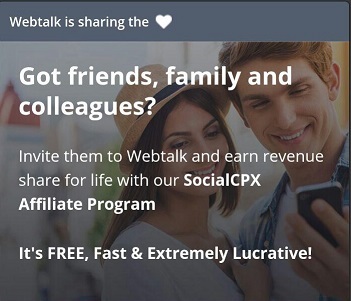 Join Webtalk now, showcase your talent, communicate better and achieve more success!